I made a cake yesterday. It was my first zebra stripe cake. I thought it would be pretty easy and fast, but it was very time consuming. 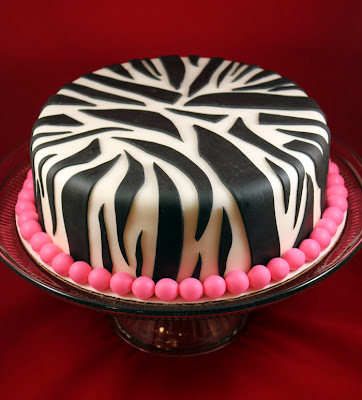 I planned out where to place the stripes before "gluing" it down to the cake. That's probably why it took so long. In addition to that, rolling the fondant ball border took a while also. I learned a neat trick though to get the balls to be all the same size. To get uniform or same sized balls for your border, you roll out your fondant flat using spacers, or rolling bands to get it to the same width. Then, using any small cookie cutter, cut out several pieces. Then roll them into balls. Every ball will be the same size. Yay. The stripes were pretty random, I just cut them out randomly, but carefully planned the placement of each stripe. On top of the cake, there is suppose to be the letter "G" in hot pink fondant. It was still drying when I took this photo. I learned another trick to get fondant to dry quicker and more sturdy. Add gumpaste. I made a 1/2 gumpaste 1/2 fondant mixture and formed the initial "G," it was the only one that defied gravity. The pure fondant ones broke. Sad =[ Gumpaste is my new love. This is the letter "G" that will go on top of the cake. I have been pretty busy this month making custom desserts for people. I'm having tons of fun and learning all these neat tricks that I get to share with you. I'm going to post some wedding sugar cookies I did this week next. I had a small birthday party this past Saturday. I was planning to make cupcakes instead of a cake for over a month now. I just didn't know what flavor to make. The horror. So I decided to make something I'd like to eat the night before the party - cinnamon rolls. So I came up with a cinnamon roll cupcake. The guests loved it! They even took some home. I also made tons of other foods. 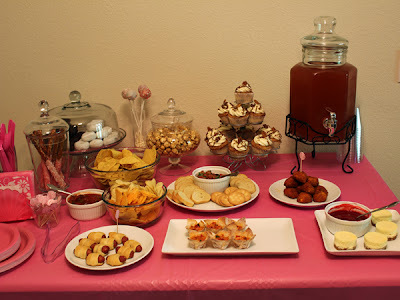 I made mini New York style cheesecakes with a raspberry sauce, chocolate dipped pretzels, mini donuts, caramel popcorns, red velvet cake pops...and oh yes - savory foods too. Which included bruschetta, chipotle shrimp wonton cups, buffalo wings, and mini pretzel dogs. The beverage of choice was raspberry lemonade. Of course, in the picture below, some guests have already eaten some foods before I could shoot a picture. Oh wells. The cupcakes are actually quite easy to make. I'm sure you and your family will love them too! Preheat the oven to 350 F. Line 24 cupcake pans with liners. Prepare the basic yellow cake batter. Use the recipe above or store bought cake mix. Fill each cupcake liner 1/4 full with batter. Mix the brown sugar and cinnamon in a small bowl. 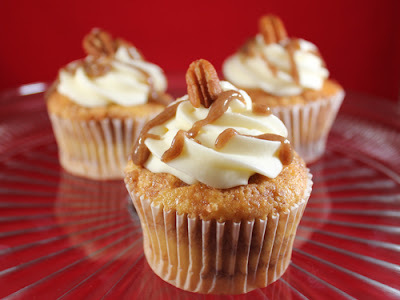 Sprinkle 1 teaspoon of cinnamon mixture all over the cupcake batter. Fill each cupcake liner again until 2/3 full, but no more. Sprinkle another teaspoon of cinnamon sugar. 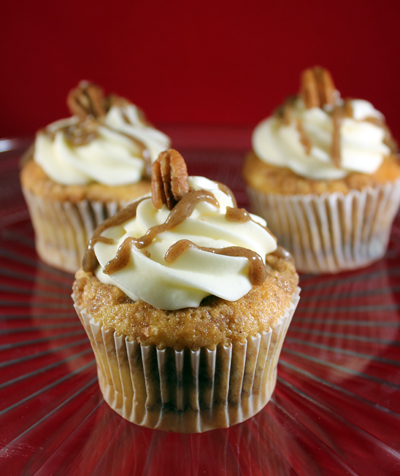 Using a toothpick, swirl the cinnamon sugar all over the cupcake. Bake for 15 mins, or until a toothpick comes out clean. Cool on a rack. In the bowl of a mixer, using paddle attachment, cream butter with sugar until fluffy. Add cream cheese and vanilla. Beat until combined, about 2 minutes. Frost cupcakes. In a small saucepan over medium heat, melt butter with sugar and cinnamon until combined and pourable, but not boiled. Let cool for a minute and drizzle over frosted cupcakes. I hope you enjoy these cupcakes as much as my guests did.